Home Dog Care 101 Breeds AAAayieee, Chihuahua! It’s Cinco de Mayo. Today, as people of Mexican heritage celebrate the Mexican army’s victory over the French at the Battle of Puebla in 1862, dog lovers are lifting tacos to the world’s tiniest breed, the Chihuahua. There is almost as much myth surrounding Chihuahuas as there is for Cinco de Mayo (no, Virginia, May 5 is NOT Mexican independence day). Were they guides to the afterlife? Companions to Toltec and Aztec aristocrats? Souvenirs brought by Spanish traders from China? Tasty snacks? Relatives of the Fennec fox, with its huge eyes and ears? The most common theory is that they are descendants of the Techichi, a small mute dog companion of the Toltecs. 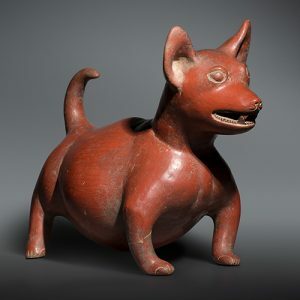 The famous red clay dog pots of Colima, Mexico, that were buried in tombs as early as 300 BCE are thought to represent Techichis. Dogs like the Chihuahua were found in materials from the Mayan Great Pyramid of Cholula, Mexico, the largest pyramid in the New World, and in the ruins of Chichen Itza on the Yucatan Peninsula. Some dog pots, dating back to about 1325 CE, have been found in Georgia and Tennessee. Wheeled toys shaped like Chihuahuas or Techichis have been found from Mexico to El Salvador and date to 100 CE. In 1520, Hernan Cortes de Monroy y Pizzarro, the Spanish Conquistador, wrote that the Aztecs raised and sold the little dogs for food. When Cortes and his successors wiped out the Aztecs, they nearly wiped out the breed. In 1850, three small dogs were discovered in the state of Chihuahua. By 1904, the American Kennel Club (AKC) had recognized them as a breed. When Rhumba king Xavier Cugat showed up in films of the late 1920s and 1930s carrying a Chihuahua under his arm, the breed took off. With domed heads and prominent eyes, Chihuahuas come in almost any color combination from solid to marked or splashed. Typical colors are fawn, red, cream, chocolate, white, black or mixed. 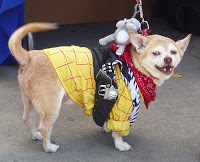 These tend to be one-person dogs who prefer the company of other Chihuahuas. Like terriers, they can be easily provoked to attack. They tremble or shiver when stressed, excited or cold. 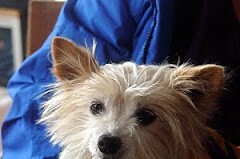 Den-loving dogs, they burrow in pillows, blankets and clothes hampers. Unlike other small dogs, they don’t need a lot of grooming. Chihuahuas are long-lived, ranging from 10 to 18 years. Picky eaters, they are prone to low blood sugar. It’s important to feed them often to avoid this. As a result, they can be easy to overfeed. Gaining too much weight can shorten their lives, cause joint problems and lead to trachea collapse and chronic bronchitis. In the right environment, surrounded by people who understand them, Chihuahuas are magnificently fun and enjoyable pets. If you’re raising a margarita this Cinco de Mayo, give a poquito tribute to the Chihuahuas of Mexico!